A comet strike millions of years ago may have set off mammalian life. A titanic comet that crashed into Earth 56 million years ago may have precipitated a sweeping global warming event known as Paleocene-Eocene Thermal Maximum (PETM). Researchers from Rensselaer Polytechnic Institute in New York conducted the study published in the journal Science. The impact is significant because it’s a precursor to modern climate change, scientists said. The occurrence released thousands of gigatons of carbon dioxide into the atmosphere causing the global temperature to elevate by 8 degrees Celsius (46.4 degrees Fahrenheit). Simultaneously, the blanket of carbon dioxide released caused sweeping transformations of life. Billions of shelled organisms died, rocks absorbed spiked ratios of carbon isotopes, and the Arctic cores melted. Scientists discovered the link between the prehistoric comet and global warming by analyzing tiny glass spheres seared into core rock samples from New Jersey and Bermuda called “microtektites.” These samples are speculated to be debris that dusted off when the comet collided into Earth. 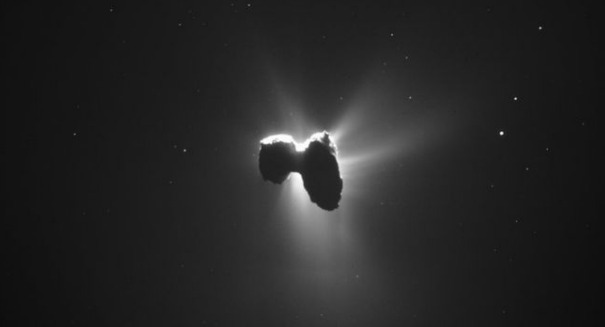 Morgan Schaller, one of the study’s scientists and an assistant professor at Rensselaer, says the discovery reveals that a comet struck the ground around the timeframe of the rock residuals. “[A] space rock hit the planet,” he says. Schaller and his team were scavenging for fossils of a minuscule organism, Foraminifera, when he spotted a microtektite in the surrounding sediment. Thereafter, they searched for more and collected three microtektites per gram of sediment. Scientists were stunned by the coincidence of a comet strike and a global warming phenomenon, but the physical evidence verifies the event. Schaller surmises the impact may have initiated severe earthquakes that released methane bottled up in the ocean into the atmosphere. The collision could have precipitated hyperactive volcanoes that released more quantities of carbon dioxide into the atmosphere. Yet Mark Boslough, a physicist from Sandia National Laboratories who did not participate in the study, says the PETM is a pivotal phenomenon and the discovery may be pioneering if it “holds up.” “It provides a big clue in the chain of discovery that we need to solve that mystery,” adds Boslough.